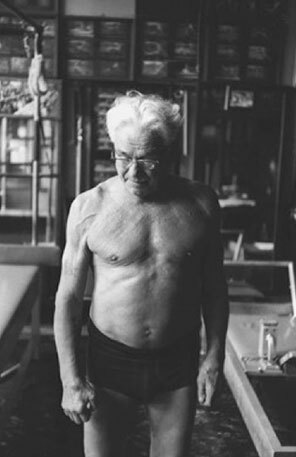 Joseph Pilates was born near Dusseldorf, Germany, in 1880. As a child he was plagued with rickets, asthma and rheumatic fever. His drive to overcome these ailments led him to explore and practice bodybuilding, diving and more. During World War I Pilates was interned in a camp with other German nationals. It was there he began devising his system of original exercises that he later called “Contrology”. By using springs from beds, he developed his earliest rehabilitation equipment for the bedridden. After the war, Pilates returned to Germany. The years following Pilates developed hundreds of exercises for the various pieces of apparatus he invented. He authored two books : “Your Health” in 1934 and “Return to Life through Contrology” in 1945- a book devoted to the mat exercises and his philosophy. In that book he writes with passion that if his method were universally adopted and taught in our educational institutions, every facet of life- from individual to universal- would improve. After moving to New York City he opened a studio. Many of Joseph’s students were dancers. His wife Clara continued to teach Pilates and run the studio after Joseph’s death in 1967. Pilates consists of more than just mat exercises. It is further enhanced by special apparatus, such as the Reformer, Cadillac, Chair, barrels, and magic circles. Joe knew his work was 50 years ahead of this time. Pilates available as private sessions, duets and small mat classes. Inquire today for rates and availability!